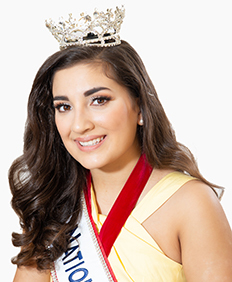 Megan Shutes was crowned Junior Miss of the Keystone State in March of 2018. She went on to compete in Orlando, Florida and became the first National Ambassador for American Pageants to date. Megan’s first competition was in Bloomsburg, Pennsylvania, where she won her first state title. She has been competing solely for American Pageants for three years and couldn’t be more grateful for the opportunities she’s received. Megan is a sophomore at Cowanesque Valley High School in Westfield, Pennsylvania. She currently holds a G.P.A. of 3.9 and plans on pursuing a career in dentistry or orthodontics. She has a deep love for music and is taking classes to further her knowledge on the entire spectrum. Megan also is an avid percussionist and choir member that has performed the National Anthem for her school’s sporting events and sang hymns at local green homes. Megan is currently helping push a movement called Community Matters- You Matter. In her small community, there is need for a big change. With her church members, Megan helps arrange and prepare free holiday meals for those who can’t afford their own. She also dresses up in crazy outfits on holidays like Halloween and does skits for her community’s children. Megan is in the process of launching a local business alongside her mother called Brookfield Soapers. This will donate a portion of all proceeds to the John Hopkin’s National Autoimmune Research. This subject is very personal and close to Megan’s heart. Megan loves American Pageants because it has opened her up to various different people and she has made lifelong friends. Through the program she’s found a new sense of confidence!